Kosikalan, 2018.04.09 (VT): Unsatisfied with the cycle of having to put increasing amounts of chemical fertilizers on degraded soil, a Braj farmer decided to do an internet search to discover more sustainable and cost effective farming methods. After his success at cultivating crops using the ‘zero budget farming’ method, Rajveer Singh is being hailed as a leader who can help other farmers in Braj become free from the burden of having to pay out big money for chemical fertilizers and pesticides. Two years ago, Rajveer Singh from Owa Bangar village in Kosikalan district was working on his family farm after passing his final school exams. He decided to do a search on the internet to discover the latest farming methods and came across the National Centre of Organic Farming (NCOF). From the NCOF website, he learnt about the methods of composting kitchen waste and other common items to create bio-fertilizer and how to make pest repellent from cow urine and other ingredients. Like organic farming, zero-budget farming focuses on the use of easily available bio-compounds to fortify crops. Zero budget farming is a step towards organic farming as it helps to free farmers from dependence on chemicals and pesticides. In the zero-budget farming method, compost is created using commonly found ingredients and kitchen waste, so farmers are able to create their own bio-fertilizer. known as the Indore Method. In the Indore method, compost is collected in a covered pit lined with cow dung. It takes 16 weeks to produce nutrient rich fertilizer at almost zero cost. 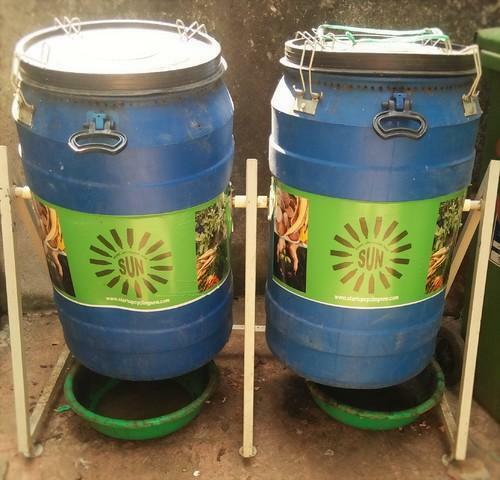 Rajveer said that he started composting using a Rs20 compost bin from the Jaivik Kendra. Into the mix went vegetable scraps, cow dung, cow urine, besan, jaggary, dry leaves and the soil from beneath a banyan tree. Composting of kitchen waste is a common practice in many countries, however, it has been slow to take hold in India as kitchen scraps are mostly fed to cows and goats. In order to deepen his understanding of zero-budget farming methods, Rajveer attended a course at the NCOF center in Ghaziabad. He was pleasantly surprised to find that bio-fertilizer was better than any chemical fertilizer. Rajveer also successfully made insect repellent and mineral supplements at home and became convinced of the benefits of zero-budget farming. Rajveer has successfully grown cucumber, bottle gourd, coriander and other crops using this method and encourages other farmers to try zero-budget farming.